Some microscopical features of the jellyfish Aurelia Aurita. The rhopalium. Macroscopic specimens can have interesting microscopical structures to observe. 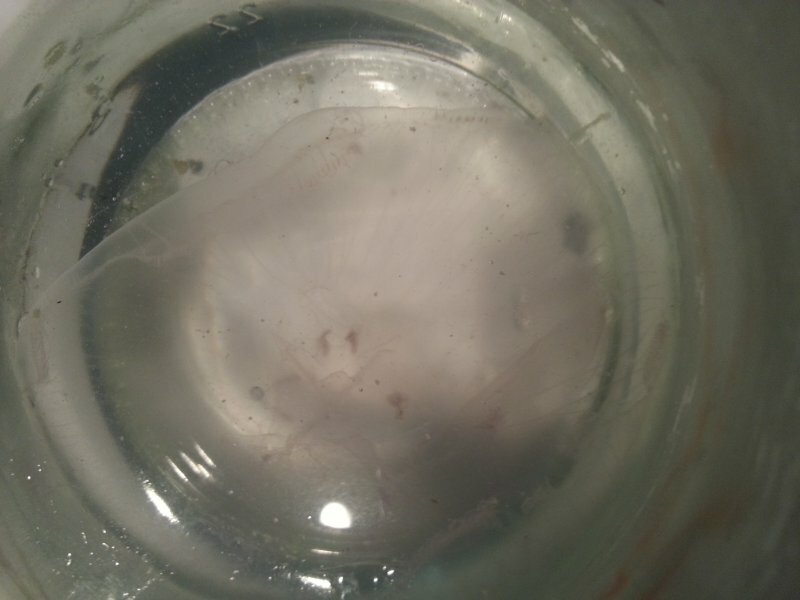 For example this spring, I found a jellyfish Aurelia aurita. All the observations below have been made during less than 2 hours and the jellyfish (living!) has been released back into the sea. 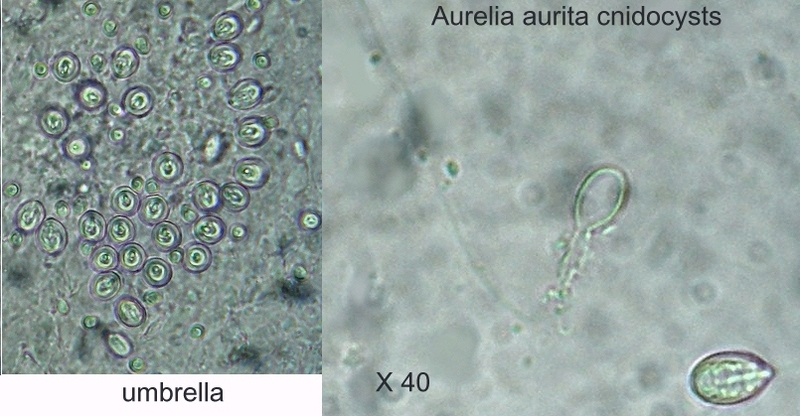 Aurelia is a little marine organism with a size about 7 to 8 cm diameter (3 inch) which appears near the coast at the beginning of spring, when water temperatures rise to around 18 – 20 °C. Often the population density can be up to dozens of specimens within a square metre. 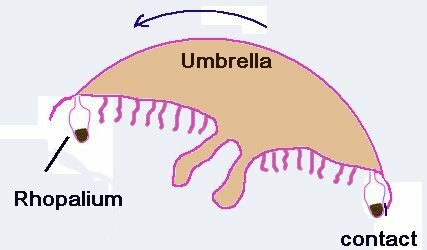 Its shape looks like an inverted pink gelatinous bowl, the upper side is called the umbrella. On the margin of the umbrella, between small tentacles, eight notches are present and they contain the objects of today's observation: Rhopalia! As you can see below, the jellyfish is very transparent in a jar! - (and moving!). Some years ago, I wrote an article in the December 2002 edition of Micscape about the equilibrium organs of various marine species. But one of these was missing in the article! 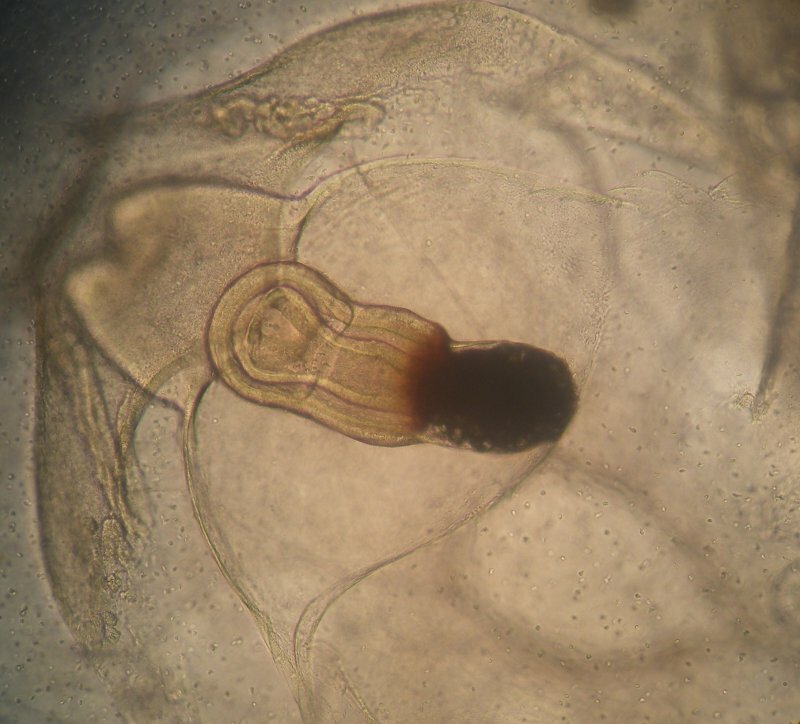 Indeed jellyfishes, and too scyphozoans, have intriguing/complex organs called rhopalium / rhopalia or tentaculocyst because it is a modified tentacle. Below: an animated gif (taken with x20 binocular magnifier and a…smartphone!) showing umbrella contractions. Using an inverted microscope it’s possible to take a closer look at the rhopalium: here with x10 magnification, you can see adjacent structures. 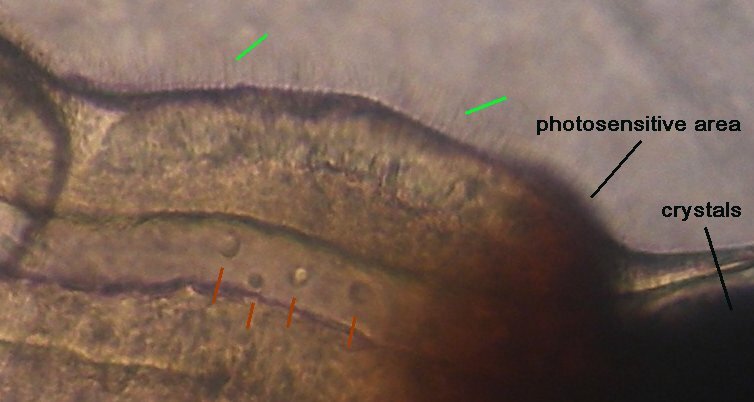 Pictures above have a reduced size according to fit with the page format: if we take a closer view at the real scale of a picture, we can see:1 : little hairs on lithostyle epidermitis (green arrow), 2 : some circulating amoebocytes / archeocytes (red arrows). Unfortunately ( ?.. but not really important because the jellyfish has still 7 other of the same organ!) during observation, the lithostyle has been broken and the little crystals inside are clearly visible: righthand side picture with polarized light. 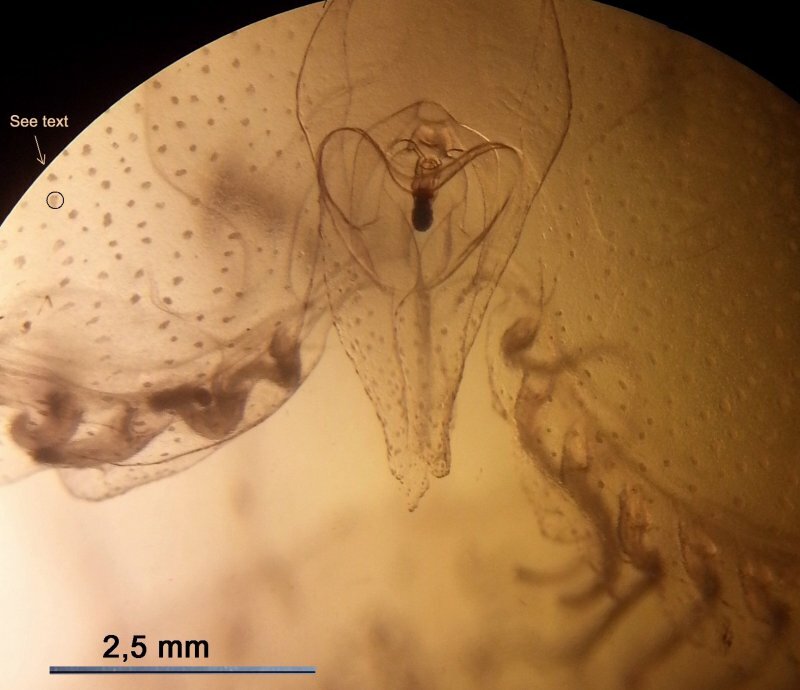 Aurelia has other interesting organs common to others species of jellyfish: small tentacles which are located around the umbrella margin and possess cnidocysts used to capture prey (copepods, fish larvae…) . In the detail (righthand side ) the arrows shows cnidocils acting like triggers to discharge the sting . But the umbrella too has groups of cnidocysts (a group formed into a circle on the third picture above: noted " see text "). Below from left to right: group of cnidocysts from umbrella (top view) and detail of two of them, the upper one being discharged. Note the length of filament which is still coiled in the other individual located on lower right corner. Comments to the author Jean-Marie Cavanihac are welcomed.